In the "good old times," the slow, soft lullaby was the first music heard in the nursery, and the tender suggestive airs, handed down from mother to daughter, still linger with us; but the lullaby itself seems to have no place nor reason for existence in this busy progressive age. Modern research in the education of infants has banished both the rocking of cradles--little Princess Mary, in 1605, had six rockers as part of her suite!--and the gentle lullaby; for we are taught now to lay our babe down in his cradle awake, in the confident expectation that he will do his duty and go to sleep, without any such aids as rocking or singing. Still the sweet crooning mother songs will never be laid aside. It "comes natural," as we say, to sing to a baby, and he shows very early that he understands and appreciates what is thus said to him by answering cooings and gurglings. By the time his is nine months old he is ready for his first songs with action--most likely "Pat-a-cake" and "Dance, Thumbkin, dance," which he learns while yet sitting on his mother's knee, and which give him the exquisite pleasure of "something attempted, something done," though it is only the moving of his own small fingers in "patting and pricking and marking with P."
The next stage in the baby's musical education follows quickly where there are elder children, for as soon as he is steady enough on his feet, he is eagerly welcomed into the dancing ring of the "Mulberry Bush," "Here we dance looby light," and is pressed to join the merry file of "Oranges and Lemons," and the advancing lines of "Nuts in May." The little beginner draws shouts of delight and approbation, with the pretty attempts to "wash his clothes," "black his shoes," and "shake his hand a little" like the rest. It is quite worth while to teach these simple old games, tune, words, and actions, as correctly as one knows how, for thereby one not only passes on a heritage intact (most of them are so ancient that one is driven to surmise that they "came over with the Conqueror," or are "Anglo-Saxon roots"), but also by exacting careful work from the first, ground is being prepared for future seed. The 'Baby's Opera" and "Baby's Bouquet"* (*Walter Crane. Routledge.) are perfect feasts of delight to little people of two years old and upwards; the picture and music alike fascinate them. Some of the songs lend themselves to action, for instance, the old favourite, "Three Little Kittens," where mother wins great applause in the part of the mother-cat, and the children distinguish themselves as kittens losing, finding, washing, putting on the much-thought-of mittens. For songs, however, that pre-eminently suggest action, so helpful in developing the little muscles, as well as habits of attention, promptitude, and order, we must, of course, pass on to the kindergarten song-books,† (†e.g., Sixty Kindergarten Songs and Games. Mesdames Berry and Michaelis.--Novello.) perfect mines of wealth in the hands of an honest, sympathetic teacher. One of the most inspiriting of these pretty games, "The Peasant," is too well known to need description. 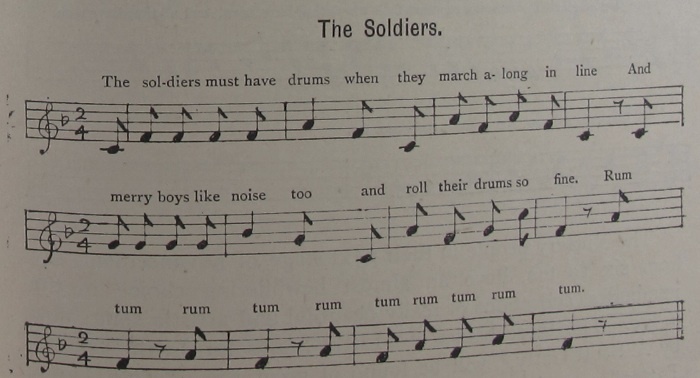 In the same collection is a very useful marching song, "The Soldiers,"
giving exercise for the arms as well as legs, in imitating the various actions mentioned, and in the last verse there is scope for pretty effect, as well as good disciple, when the little soldiers face, before taking their "quiet rest." The "Pigeon House" is also a great favourite, and gives an opportunity to the very little ones, who take the part of pigeons while the elders, in a ring, form the house. 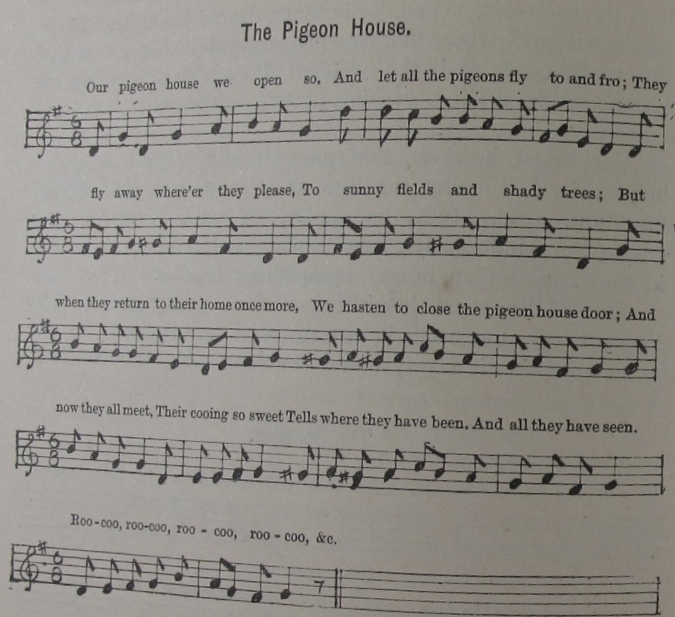 The little pigeons run merrily about as they please till the door has to be closed, when all coo softly till the end of the song. The Nursery people in their next stage of advancement, say from six to ten, have an almost bewildering choice in the numberless collections of really beautiful and artistic songs now in use. The three books of "Little Songs for Little Voice," by A. Scott Gatty,* (*Metzler & Co.) will be found of great use. "Rain Drops Patter," several of the Christmas songs, "He, She, It," and "May Day" are especially pretty, and the setting of the song from "Alice in Wonderland," "Will you Walk a Little Faster?" gives scope for some pretty acting. The whiting and small walk arm in arm, followed by the porpoise and the lobsters, each singing its own words; any descriptive ones, e.g., "Said a Whiting to a Snail," to be sung by all. For the chorus, all can dance in a ring, or do grand chain, or do the balancing step, holding hands. A very beautiful collection is that by Mary Carmichael and Christina Rosetti. * (*"Sing Song." Stanley Lucas, Webber & Co.) Where every song is really a musical gem, it is difficult to particularize, but amongst the chief favourites are "Ferry me across the water," "The days are clear," and "Who has seen the wind?" 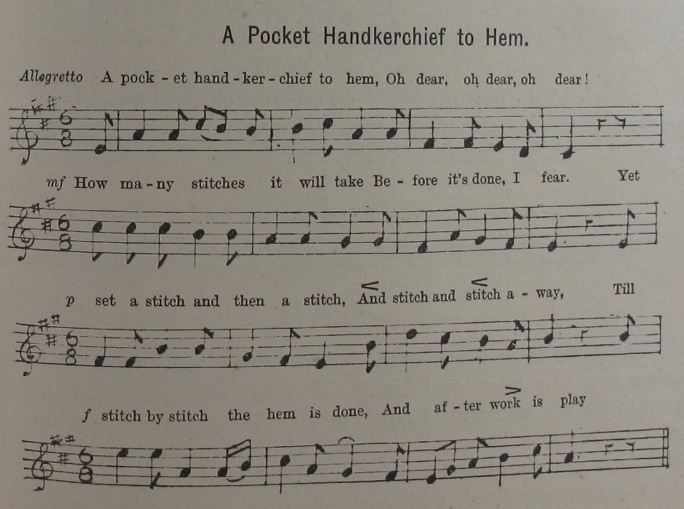 One of the most suitable for action is "A pocket-handkerchief to hem." The little workers stand in a row, imitating the manner of sewing (with hem of pianafore), till the words, "And after work is play," which may be sung twice, while all dance merrily round; then, suddenly breaking the ring again, all stand still in the line as before. 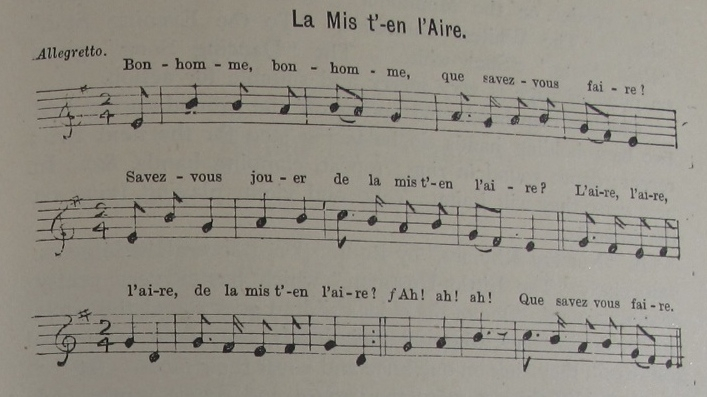 Of foreign songs, those most accessible to us are the French and German. Collections of these are published with the words translated into English, but it is needless to say that they "go" infinitely better in the original languages, and children are very quick in learning the words, and getting a fair idea of their meaning. 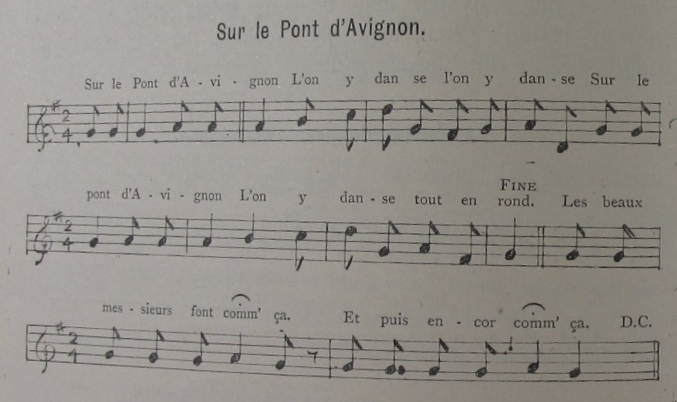 "French Rounds and Nursery Rhymes"* (*Augener & Co.) is a very pretty collection of easy French songs. The best known, perhaps is "Sur le pont d'Avignon," which gives much scope for graceful dancing and action. The chorus can be danced in a ring, as a grand chain, or as the figure of eight. The bows and curtsey's of the fine gentlemen and ladies are very effective, and imagination and time alone limit the number of variations that can be attempted. The string of Capuchins, walking with bent heads, and hands in sleeves to, to slow time, makes a good foil to some of the more lively impersonations. The same book furnished a delicate little movement in a minor key, "La Mis t'-en l'Aire." The children can take it in turn to ask the rest, with French gesture, the opening question of each verse. Then all answer, with appropriate action, that they can play the flute, violin, &c. Then, clapping hands three times, they finish with curtseying low to each other. "La Monaco" and "Ramène tes Mountons" are also particularly pretty and inspiriting dancing games. Augener also publishes several collections of German songs, amongst which may be named that of "Carl Reinecke's Fifty Children's Songs", many of which are very beautiful, such as "Up yonder on the Mountain," "When the Little Children Sleep," "The Whitest Lambkins," "To the Evening Star," "Rain Song," "Snow-white." 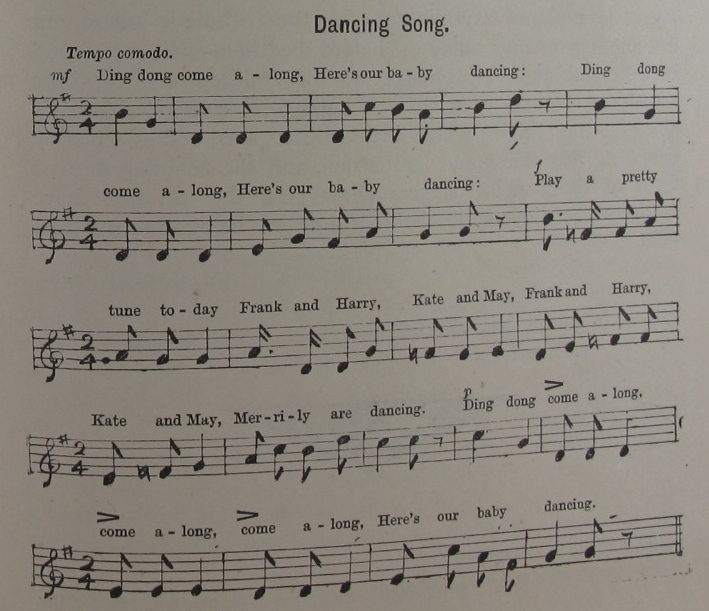 The "Dancing Song" given on previous page is very merry and suitable for action. Children clap hands and spring off the ground during first two bars, holding hands do balancing step for the next two; repeat; dance around in ring; repeat, clapping hands, &c. In next verse they will imitate 'cello and violin playing, lying on the grass, &c.
In "Nursery Rhymes," by Brahms,* (*Augener & Co.) are several little gems, particularly "the Little Dustman," which has a very pretty accompaniment. One of the elder children goes round the circle of little drowsy ones, who nod their heads, sway their bodies to and fro, till they sink on one knee and cover their faces. At the second half of the last verse they rouse and dance gently, and can sing "Awake, awake, my little one!" instead of "Sleep on! " as before. The little games and songs that have been thus briefly touched upon are all possible to a nursery party of three to six ore more children, and their use, or of others like them--say at least for twenty minutes after the arithmetic lesson and for another twenty minutes before bedtime--will be found both helpful and very pleasant to the children, and to those who have the care of them. A happy yet controlled bent is given to the bright, active little spirits and bodies, thereby banishing fidgetiness and inattention, and the beaming earnest faces of the dancing singers show that the children have attained that joyous teachable frame of being as "good as gold."